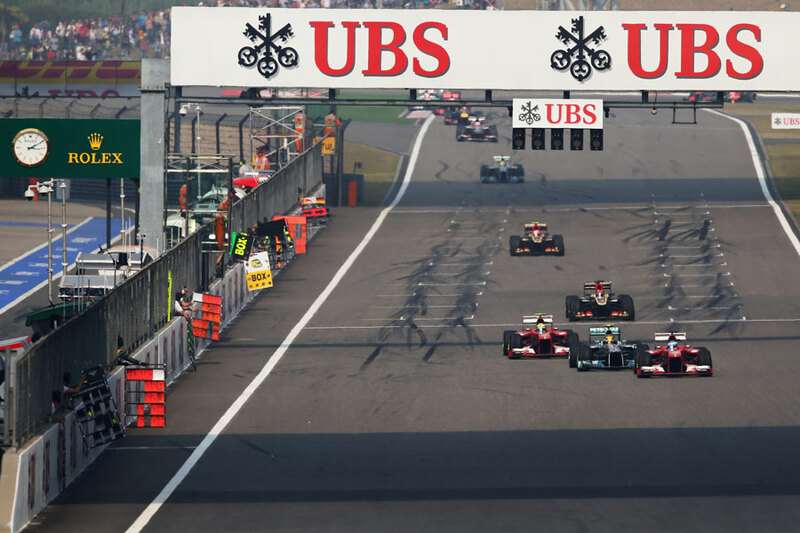 Fernando Alonso comfortably won the Chinese Grand Prix ahead of a close battle for second place between Kimi Raikkonen, Lewis Hamilton and Sebastian Vettel. Alonso took the lead early in the race from Hamilton and slowly eased away from the pack despite the field often being mixed up due to differing strategies. Raikkonen came home second, just 2.1s ahead of Hamilton who held off a charging Vettel - on soft tyres at the end - by just 0.2s across the line. Jenson Button was fifth ahead of Felipe Massa, with Daniel Ricciardo coming home an impressive seventh. Mark Webber - starting from the pit lane - retired with a loose right rear wheel after having to pit following a collision with Jean-Eric Vergne, while Nico Rosberg's race also ended prematurely with a suspension issue. 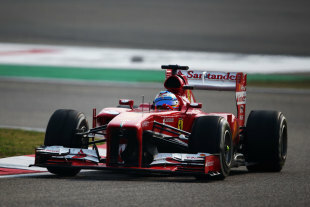 Hamilton led away from pole while Raikkonen dropped back to fourth place behind the two Ferraris. Crucially, Hamilton couldn't break the DRS gap and on lap five both Ferraris found a way passed; Alonso using DRS over the finish line and Massa following him through in to turn one. At the end of the fifth lap Mercedes pit both cars at the same time, while Alonso and Raikkonen pit on the following lap. Ferrari's decision not to stack its cars in the pit lane cost Massa, with Hamilton, Raikkonen and Webber - who had pit at the end of the first lap to get rid of his soft tyre - leapfrogging him. As the pit stops were playing out there was a collision at Turn 14 as Esteban Gutierrez ran in to the back of Adrian Sutil, taking both out of the race. A large list of drivers - Vettel, Webber, Raikkonen, Button, Romain Grosjean, Valtteri Bottas and Max Chilton - are all under investigation for using DRS under the resulting yellow flags, with the FIA still unable to disable it from race control. Button, Vettel and Nico Hulkenberg had all started on medium tyres and it was Hulkenberg who had risen to the front of the trio by the pit stop phase, leaving him in the lead. The pair pit together on lap 14 and Vettel got the jump on the Sauber, rejoining behind team-mate Webber. However, hopes of an on-track battle were dashed within a few corners as Webber ran in to the side of Vergne at Turn 6 and lost out to Vettel before retiring as his right rear wheel dislodged at Turn 14. A lap later Raikkonen also had contact at Turn 6, getting forced on to the kerbs and grass under braking by Sergio Perez and slewing in to the back of the McLaren. Both continued but Raikkonen finished the race with a damaged front wing and hole in the nose of his Lotus. It didn't hurt his pace too much, however, as he caught the back of Hamilton and jumped him in the final round of pit stops. Alonso had eased away at the front after passing the two-stopping Button and was able to pit under no pressure for the final time. Learning from Hulkenberg - who had put on soft tyres at his second stop and dropped out of contention - Button pit for soft tyres in his final tint with six laps to go and jumped Massa but couldn't chase those ahead. Vettel led briefly as he looked to wait as late as possible to put on the softs, finally making the switch with four laps to go. Although Button couldn't get the pace from the option tyre, Vettel proceeded to reel in Raikkonen and Hamilton ahead. As Hamilton fell slightly off the back of the Lotus, Vettel closed down a gap of 13 seconds to attack on the final lap but outbraked himself slightly in to Turn 11 on the final lap and eventually crossed the line right behind the Mercedes. The provisional result leaves Vettel leading the championship by just three points from Raikkonen, nine points from Alonso and twelve from Hamilton. Dereck Chisora has launched an angry rebuff to claims that he is "too short" to fight Wladimir Klitschko, both in terms of height and ability, labelling the accusation "stupid".